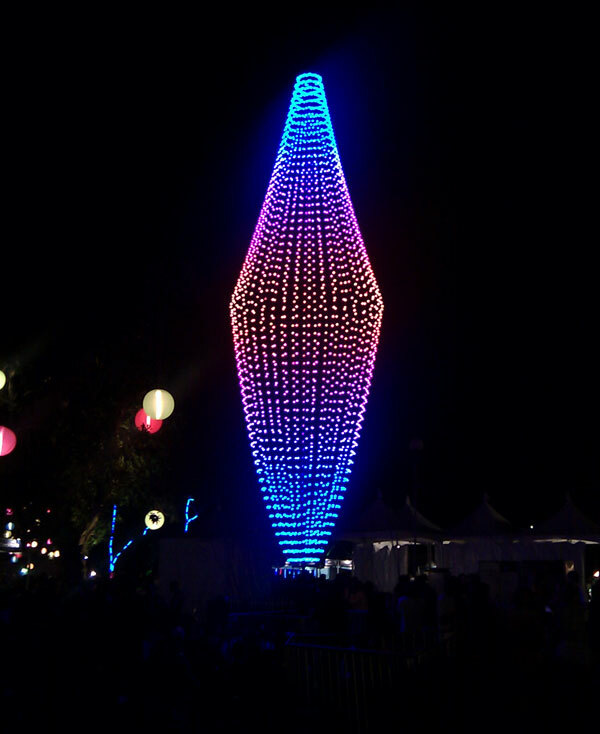 A 40 foot tall rhombus shaped tower, consisting of 40 vertical strings of 60 lights on its outer surface (2400 lights). May 18-20, 2012. Electric Daisy Carnival. New York, NY. June 18, 2011. Electric Daisy Carnival. Dallas, TX. June 11, 2011. Electric Daisy Carnival. Aurora, CO.
May 27-28, 2011. Electric Daisy Carnival. Orlando, FL. Apr 29-30, 2011. 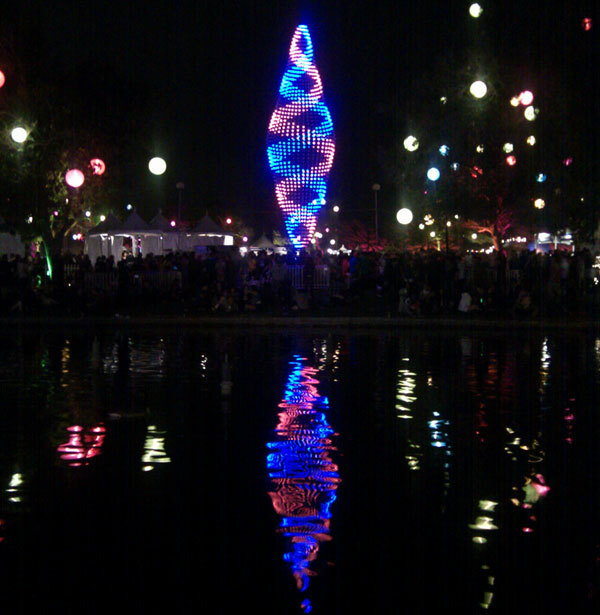 Nocturnal Festival. Austin, TX. Mar 19, 2011. Beyond Wonderland. San Bernardino, CA. The Diamond Tower is available for events around the world. It runs a pre-programmed loop of 30+ effects lasting over 45 minutes. It also has real-time control capabilities and the ability to scroll text messages. It requires either one 120v 20A circuits or one 220v 10A circuit. It can be assembled by 3 people in about 4 hours and taken down in 2 hours. It packs into a shipping crate about 36"W x 82"L x 48" H and weighs about 1000 lbs. It can be erected without any special equipment or cranes. It needs a footprint of 6x6 feet for the base, and 3 guy wires that are staked down 32 feet from the base.